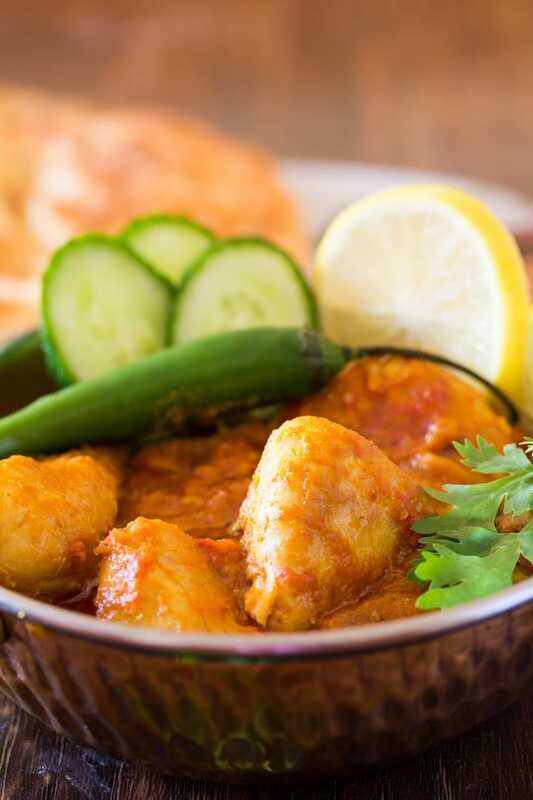 This Pakistani Chicken Karahi (also sometimes called kadai chicken) recipe is a quick and delicious, and a very popular Pakistani Chicken Curry. It’s made with chicken, lots of tomatoes, ginger & garlic, and a handful of spices with a sprinkle of chopped coriander. It’s lovely paired with naan or rice, and one of my favorite combinations to have is Chicken Karahi and this Daal. If you’re from Pakistan / India, it’s likely you’ve heard of chicken karahi. It is quite popular at dhabbas (small street side restaurants) and is often made at home too. And everyone has a different recipe. But one thing is for sure, an authentic Chicken Karahi is not made using onions (as a lot of other curries do require chopped onion) and usually does not require a lot of spices or extra water to make the gravy. It’s super delicious paired with naan or rice, and it’s so very easy to make. Which makes it blog worthy for me, because my motto for cooking is maximum taste but minimum effort. So lazy cooks (I’m one too 😀 ), rejoice and add this Easy Chicken Karahi recipe to your weekly rotation! Karahi Chicken is a delicious Pakistani chicken curry that’s made with bone-in chicken, some basic household spices, lots of tomatoes and chopped coriander. It’s called karahi chicken because this recipe is made in a karahi. And what’s a karahi? More on that below. What is Karahi Made of? So Karahi is basically like a two handled wok, but it’s typically made out of cast iron and is a bit deeper than the wok. However, you can use a wok to make this Chicken Karahi, and quite honestly I’ve also gotten away with making it in a regular pot. The point though is that Chicken Karahi is typically cooked on high heat, and that’s why a karahi or a wok works well for this Pakistani chicken curry. To make this easy chicken karahi, you’ll need bone in chicken. However, if you want to make bonelesss chicken karahi then you can use chicken breasts or chicken thighs cut into 1 inch pieces. Ginger and garlic, to fry the chicken in. You’ll need lots of ripe tomatoes for this chicken karahi as that’s what the main flavor base is here. And at one point it may seem like you need to add water, but do not add water. The tomatoes will release their juice and that’s what lends to the gravy of the chicken karahi. Basic spices like kashmiri red chilli powder, turmeric powder, and sometimes coriander and cumin powder but I don’t use them in this recipe. I feel like the simpler the ingredients are, the better the chicken karahi tastes. Some chicken karahi recipes call for onions, but I believe authentic chicken karahi is not made with onions. And that’s perfect for me, because chopping onions make me cry like I broke my cell phone. Lol. As it is mentioned in the recipe card below, it’s ideal that you use bone in chicken. 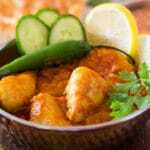 The reason for this is that traditionally this easy chicken karahi recipe is made with bone in chicken, and it is what makes the dish more flavorful. However, you may use boneless chicken breasts or thighs (chopped into cubes) to make this recipe. I would personally suggest boneless chicken thighs if you do not want to use bone in chicken for this recipe. Since the main flavor base comes from the tomatoes in this recipe, make sure to use very ripe tomatoes. You will notice that in the recipe card there is no mention of adding water or any other liquid to make the gravy. The gravy (although there’s not a lot of it) only comes from the tomatoes. Please do not add water to curry, as it will impact the flavor of this chicken karahi and will basically water down the flavor. For most recipes originating from the subcontinent, the main flavor of cooking comes from a cooking process called bhunnai which is basically cooking the recipe until you can clearly see the oil separate from the curry. For this Easy Chicken Karahi Recipe, we do this twice, once when we add the spices (which ensures the spices are cooked) and as a last step too. This is what brings out the most flavor in any curry, and is an important step so do not skip it please! While the chopped cilantro / coriander and green chilli are optional, I believe they do add a lot of punch to the recipe and therefore highly recommend not skipping them. Looking for More Delicious Pakistani and Indian Recipes? Note: This recipe was first published on 6th November 2017. It’s been now updated for some additional information. 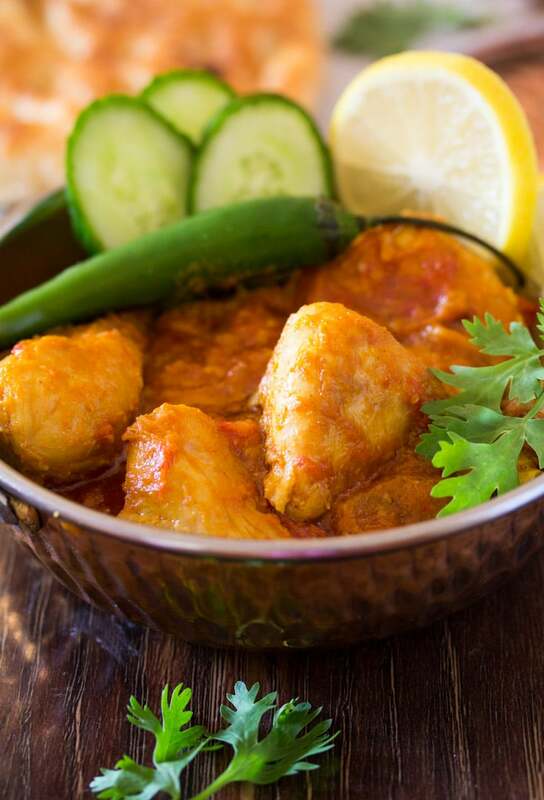 This Easy Chicken Karahi Recipe is the perfect Pakistani chicken curry, that is super delicious and also quick and easy to make! It pairs perfectly with naan or white rice, and once you make it you'll be hooked! In a large, heavy bottomed pot heat the oil and add the chicken pieces. Saute the chicken pieces for a few minutes (2-3 minutes) until the chicken changes color. Then add the garlic and ginger paste, and saute the chicken for another 2-3 minutes. Now add the spices (red chilli powder, turmeric and salt) and saute on medium high heat for 5-7 minutes or until the oil separates from the chicken. Keep stirring the chicken frequently during this step. Add in the chopped tomatoes and stir the pot. Then lower the heat to medium low, and cover the pot until the tomatoes have softened. This will take about 15 minutes. Stir the pot a few times during this time, ensuring that the chicken doesn't stick to the bottom of the pot. Once the tomatoes have softened, take off the lid and stir and cook on high heat until the oil separates once again. This will take about 5-7 minutes depending on the heat of the stove. Garnish with freshly chopped cilantro / coriander and green chilli. Serve with naan or white rice. Enjoy!